Did someone say maple? Mmmmm. Vermont loves maple. So will you! Enjoy. Place a large rimmed baking sheet in oven; preheat oven to 425°F (leave pan in oven as it preheats). Combine sage, mustard, and syrup in a small bowl; brush evenly over chicken breasts. Carefully remove pan from oven. Add chicken to pan; bake at 425°F for 20 minutes. Remove pan from oven. Discard any juices from pan. 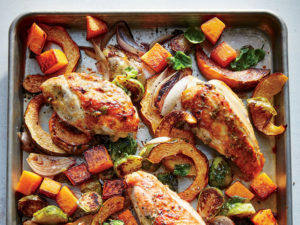 Add butternut squash, shallots, acorn squash, and Brussels sprouts to pan with chicken. Top vegetables with butter, oil, 3/4 teaspoon salt, and 3/4 teaspoon pepper; toss. Spread in an even layer around chicken. Sprinkle chicken with remaining 3/4 teaspoon salt and remaining 1/4 teaspoon pepper. Bake at 425°F for 20 minutes or until chicken is done. Remove bones from chicken before serving; discard.